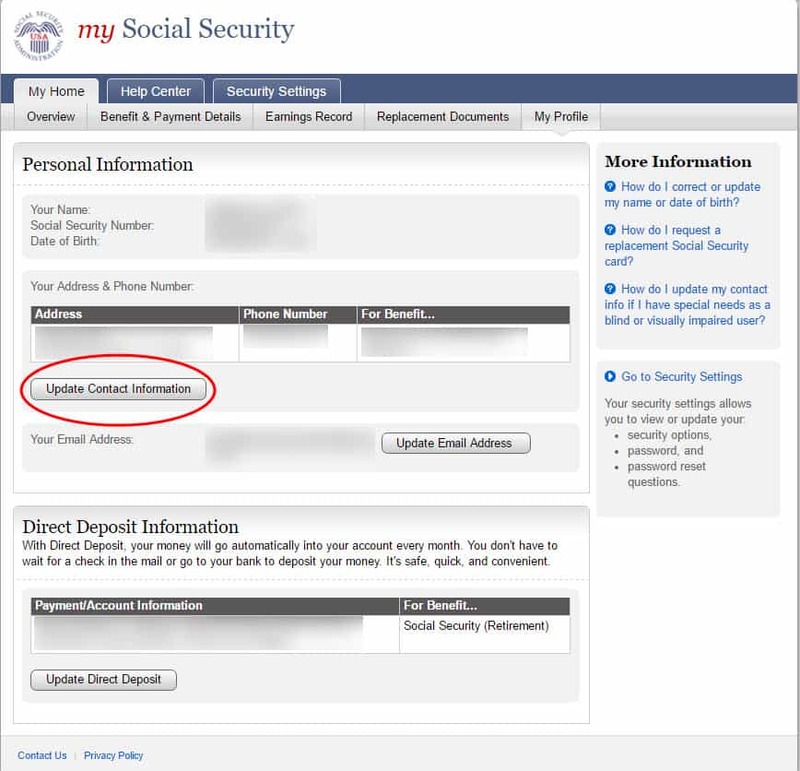 If you’re receiving Social Security benefits or Medicare and have recently moved, your Social Security change of address needs to be high on your priority list. 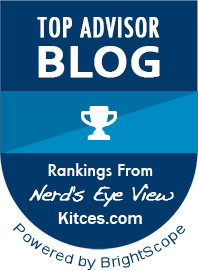 The Social Security Administration makes it clear how important this is in their publication What You Need to Know When You Get Retirement or Survivors Benefits. Ouch! You don’t want that to happen. Thankfully, it’s pretty easy and painless to get your address changed. You just have to choose which of these three approaches will work best for you. If you’d like to see someone face to face when making the address change, your best bet will be visiting your local Social Security office. You’ll be able to verify the information was recorded properly and ask for a printout that will serve as your proof of the update. However, you should be aware that this will not be your fastest option! The wait times can be more than an hour on busy days. If killing time in a waiting room is not your idea of efficiency, you may want to consider making a simple phone call. 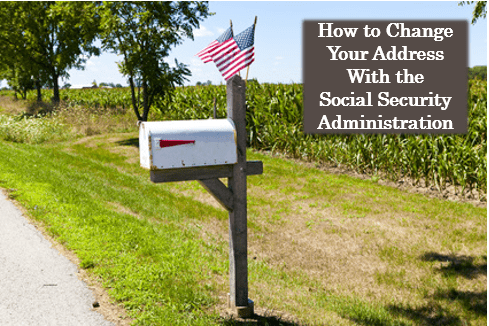 In my past experience, I’ve found that the Social Security Administration will change your address over the phone. This is easier than visiting your local office and waiting. If you choose this route, here’s a tip. Call your local office instead of the main Social Security line. In many cases this will cut the wait times in half. This is by far the easiest approach. With just a few clicks you can make the address change and move on to more pressing issues. If you want to see a step-by step video guide, go to the bottom of this article. 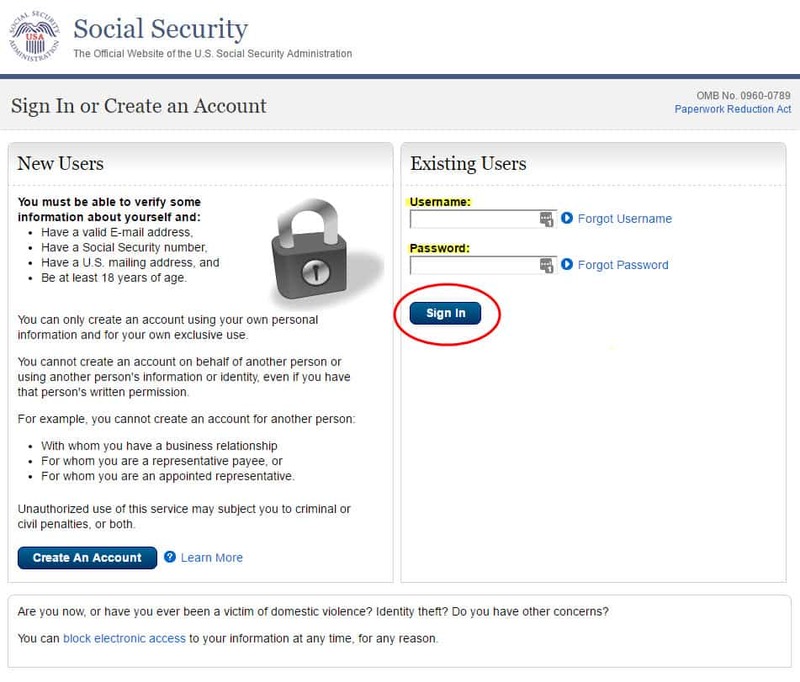 Visit www.ssa.gov/myaccount to get started. Feel free to click the link. 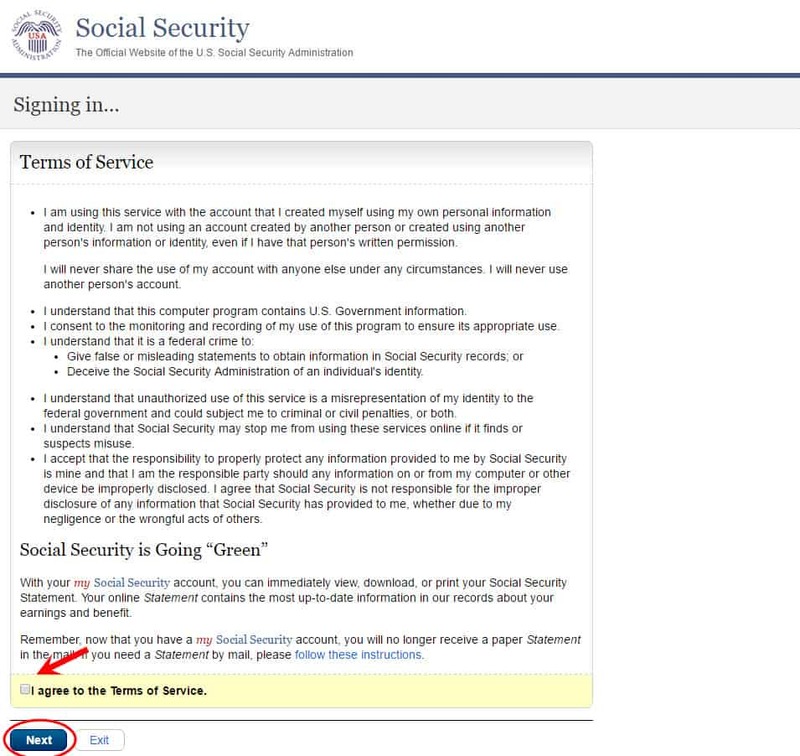 It will open Social Security’s website in a separate page so you can keep using this guide. Now that you are on the home page, you just need to find and click on “My Profile” tab in the top right. On the profile page you’ll see the option to update things such as your contact information, email address and direct deposit. For the purposes of changing your address, you should click on the “Update Contact Information” tab in the middle of your screen. The next screen is simply a review and confirmation of the provided address and phone number. From this point, you’ve successfully changed your address. All without leaving the comfort of your home too! 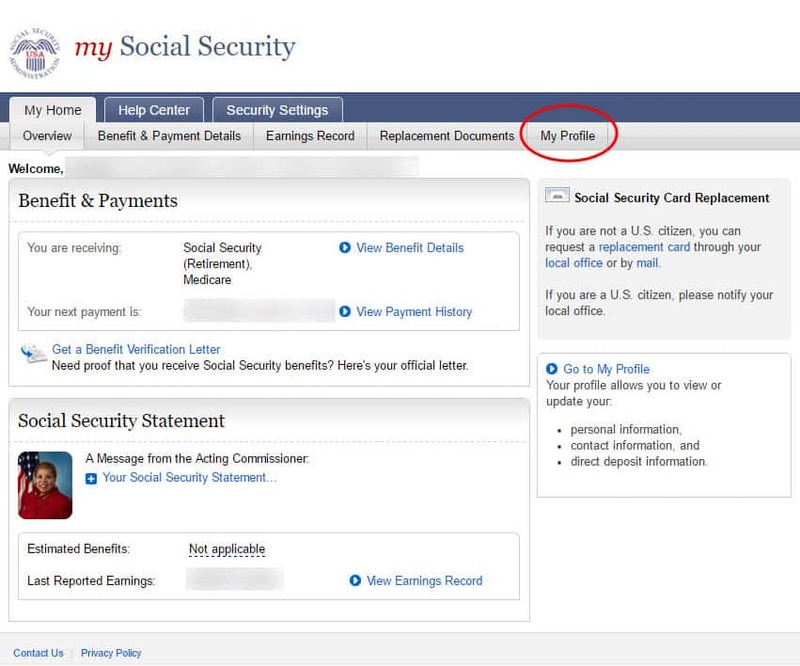 I hope this guide has been a helpful resource for your Social Security change of address. Now I’d like to ask a favor from you. When you visit this site, please let me know if the screens you see are different from what I have in this guide. 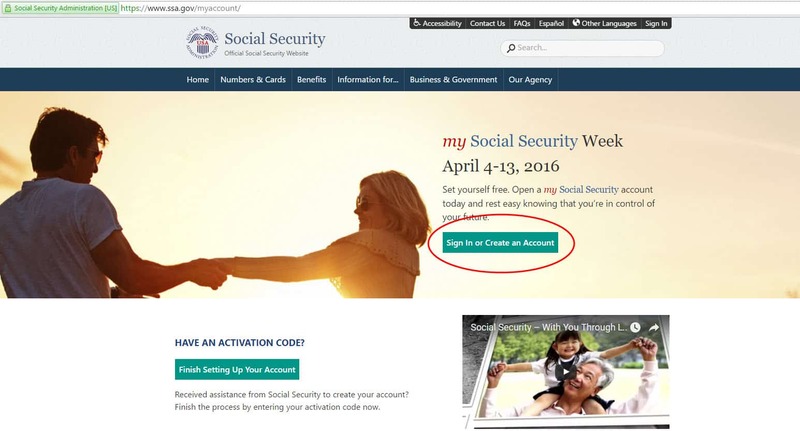 The Social Security Administration changes things up occasionally and I want to keep this how-to guide as updated as possible. You can just let me know in the comments below. As a parting thought, if you are getting ready to retire, I’d highly encourage your to take charge! And one of the best ways to be in charge of your retirement plan is to engage in self education. There are some excellent books on the market now that are designed specifically for those in your situation. They are not heavy literary works but easy readers that contain valuable pieces of information that can help you make great decisions, keep you protected and potentially change the trajectory of how you spend the best years of your life. The my profile tab is not there. As mentioned below the only menu options available were to view the overview, message center and security settings; then on the side, estimated benefits, earnings record, and replacement documents. I just received a letter yesterday in the mail from ss telling me they are stopping my payments because I Did not change my address. Does anyone know how long it takes to start getting my monthly payments going again once I change my address? I’m calling the office once they open today but I am sick with worry and am hoping I can get some answers from someone here. Thank you. Hi. I went through the instructions as lined out above, but could not find the option to access “my profile” or change my address. The only options available were to view the overview, statement and benefits. 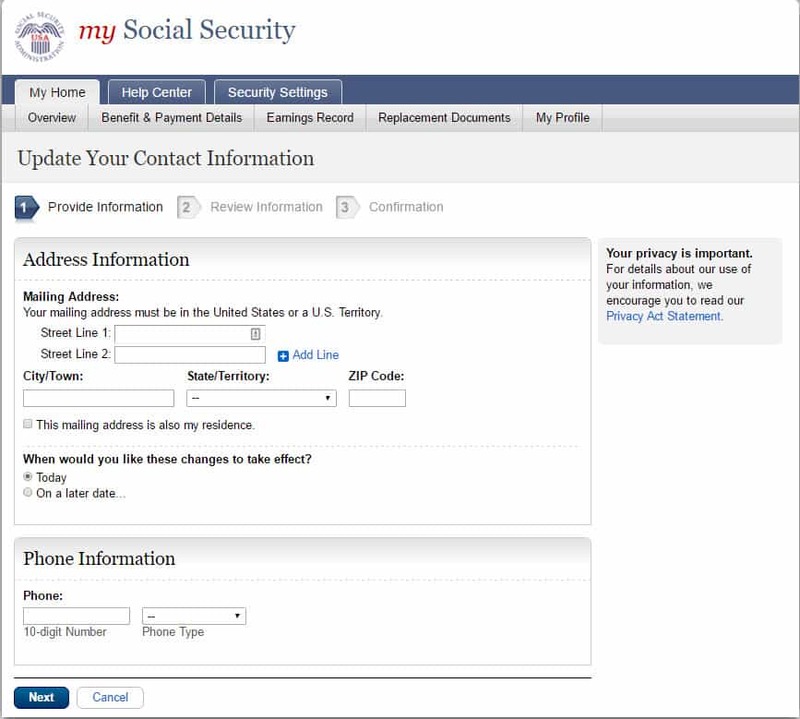 I literally had to call the Social Security Administration to schedule a phone-call appointment to update my address. Hello this is Samantha. I’ve been getting my disability check deduct deposit in to my aunt’s account…..I need to talk to sumone about changing it and my address..please call me asap..